The Jerusalem Post recently featured Genesis at the Crossroads, the acclaimed NGO founded by Wendy Sternberg in 1999 while she took part in Landmark Education’s Self-Expression and Leadership Program in order to bring peace and understanding to the world through artistic expression. The diplomats of the world can argue about what peace looks like and how to achieve it, but Wendy Sternberg knows what it sounds like – an Iranian Santour player, an Israeli-Arab oud player, Indian and French-Canadian percussionists and an American on the keyboard and harmonica, led by a cantor in a Greek-inspired rendition of L’cha Dodi in the auditorium of the Jerusalem YMCA. Sounds like a cacophonous mix – but for Sternberg, it’s perfect harmony, and a dream come true. These are the musicians that make up Saffron Caravan, the musical ensemble of Sternberg’s Chicago-based non-governmental organization, Genesis at the Crossroads. Genesis’s mission is to use the arts as a vehicle for peace-building by creating and implementing innovative artistic, arts-education and humanitarian programs worldwide. It has just completed its first Israel tour and shows no sign of slowing down. Genesis bgan its work through half-day workshops and soon grew. In 2004 the organization held a weekend-long festival featuring 130 artists. IN the finale, two musicians – a Muslim and a Jew who had never met before – performed together. Saffron Caravan was established in 2007. When choosing musicians for the ensemble, she had clear criteria. “They are all hand-picked…either artists with whom I had worked before or who intrigued me,” she said. “They had to be artistically gifted musicians who could work together with an ensemble…[with] a level of inspiration about the mission and willingness to contribute.” She says that politics has never been an issue among the musicians, who hail from the US, Canada, Cuba, India, Iran, Israel and Afghanistan. Saffron Caravan has performed throughout the US, including at the United Nations 60th anniversary, and in Morocco. She describes Morocco as a natural choice and a “cultural crossroads…[full of] different faith-based communities work together…it was a great platform for launching the concept.” However, a planned performance at Egypt’s Alexandria Library was canceled when Sternberg discovered that the group’s work would be censored by the government. She also declined an invitation to perform at Israel’s 60th anniversary celebrations, saying that the group does not perform at political events. But Sternberg, who has spent significant time in Israel, knew that she would come here eventually. “If you can do it in the Middle East, you can do it anywhere,” she adds. She acknowledges that working in the Middle East is not easy, but she took the challenges in stride. “Sometime in the future we will go,” says Sternberg. 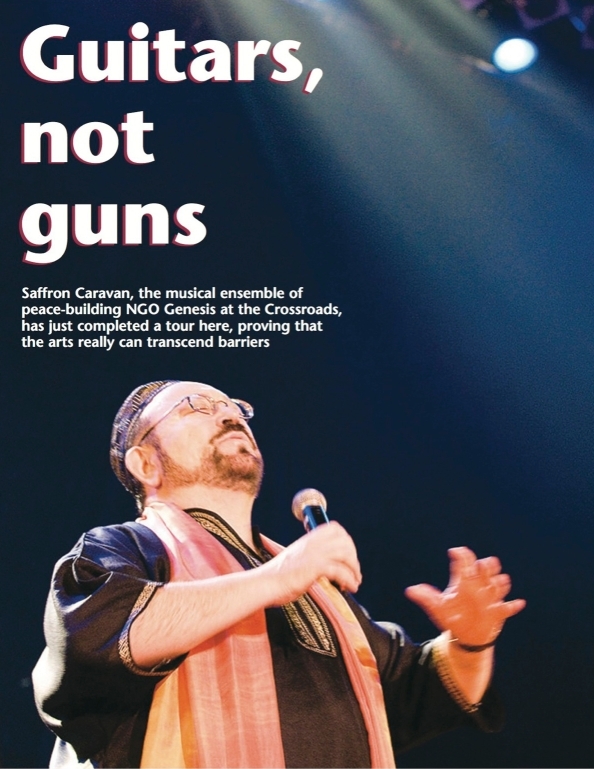 Saffron Caravan’s itinerary included performances in Jerusalem, Tel Aviv and Beersheba and workshops in several schools. A special emphasis of the tour was building a connection to the Beduin community. The encounter with the Beduin community was a chance for Genesis’s humanitarian wing to shine. Through a program called “Arm Them with Instruments,” Genesis brings gently-used instruments to youth in conflict regions. At Saffron Caravan’s Jerusalem perfomance, the audience was almost as varied as the performers – hijabs mingled with kippot and dialogue was translated from English into both Hebrew and Arabic. The group’s music is eclectic and energetic. It ranges from Afro-Cuban spirituals to traditional Turkish and Arab songs to original santour pieces by Iranian Ku Hagighi, in which his mallets fly across the instrument at breakneck speed. Each instrument and performer is given a chance to shine, but the mix between them is unexpected and special. After all, when is the last time you heard an oud and a harmonica play together? Howard Levy is the musical director of Saffron Caravan. He has been with the project since the days of the Chicago festivals and, like all of the performers, has had a distinguished musical career. He says that he was attracted to the musical aspects of the project, but that those aren’t so separate from its greater goal. Alberto Mizrahi, a noted cantor and Saffron Caravan’s vocalist, agrees. “We don’t hide it,” he says. “We are spreading a message of peace and love, but we’re also [here] for the music. We want to take it to people who don’t know it – like Beduin that wouldn’t expect a Jewish guy with a yarmulke to be singing in their village. Haytham Safia is a lauded oud player who grew up in Kafr Kasif in the northern Galilee. He said that he’s used to connecting cultures. “I grew up Muslim, in a Christian city, in a Jewish country,” he explained. An added bonus in the group’s Israel tour was the participation of Peter yarrow of the folk group Peter, Paul and Mary. To the delight of the Jerusalem audience, he performed some of his classic songs together with the ensemble. Yarrow also added that he was attracted to a new project that Genesis at the Crossroads is launching – a Junior Saffron Caravan. Wendy Sternberg wants to assemble a youth ensemble to continue the group’s work. Sternberg’s plans for Genesis and Saffron Caravan are ambitious: a Latin-American tour, the development of the future Genesis Institute for Global Leadership and the expansion of the Junior Saffron Caravan concept to include ensembles throughout the world. But on the night of the Jerusalem performance she, like everyone else, was reveling in the moment. The performance ended with the musicians and the youth playing Chicago blues classic in homage to Genesis’s roots. For members of the audience, what may have sounded strange and impossible mere hours before was happening before their eyes – a mix of old and new, East and West, musicians whose countries are at odds playing together and making beautiful music. It seemed like the most natural sound in the world.